“Join Wizard” – remembers how you, or your selected database experts, join DB2 files as your NGS-IQ queries are built and maintained. As others build queries over the same files, NGS-IQ instantly fills in the matching fields as they were previously joined. Meta files – joins up to 32 DB2 files and then assigns the entire collection of joins a descriptive or “meta file” name. Your users no longer need to understand names of actual files and how to join them. Streamlined file join changes – primary file and join type can be reassigned after the query is built. Easy file joins – inner joins, partial outer joins, and exception joins are handled in simple English. File joins that can be based on new or “derived” fields – no need to create a temporary work file when the desired files cannot be joined on any of their existing fields. “One-to-many” relationships – when you have multiple records joined to a single record, you can simplify report design by defining comparisons between a field’s value in the current record and the same field’s value in the previous record. DB2 file member support – file members may be selected within the query and changed at run time. File union – consolidated view of data stored in up to 32 files or file members. Answer questions such as these: Who created the query and when? Who ran or updated it last? When was it last run or updated? How many times has the query been run or updated? Answer questions such as these: What files does the query access? What queries must be updated if we change this file? 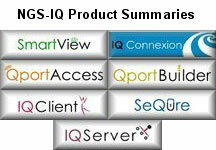 NGS-IQ, IQ Server, IQ Client, SmartView, Qport Builder, Qport Access, IQ Connexion, and IQ SeQure are trademarks of New Generation Software, Inc. All other trademarks are the property of their respective owners.